This ambitious novel takes its title from Yeats and continues in an Irish vein bringing in everything that Bengali literature lovers know about Ireland, like the shadow of Ben Bulben, the oppressive landlords, beautiful Irish women with red hair and the Potato Famine, all of it written in the rhythms of Irish speech. No Country starts with a murder in modern America, with a cop from Hungary present, and then begins to move back in time. 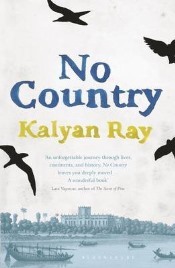 Kalyan Ray maps a violent past and present on a canvas in which identities are lost along with countries and lovers fall away. He looks at India through the world of the outsider, the Anglo Indian who is neither here nor there, as shown by the Jalianwala Bagh episode which his protagonist happens to see conveniently framed in the window of an old house in Amritsar. The witnessing of the episode is admittedly contrived since the protagonist has to travel to Amritsar with his father from Calcutta to find that handy window – in fact many readers will think quite a few places in the novel are either contrived or familiar since the loss and longing of migrants and the perils of sea voyages and floggings, not to mention US university life, have appeared in the works of quite a few writers. Anglo Indian life in Ray’s novel owes a great deal to the influence of his wife Aparna Sen, whose 36 Chowringhee Lane was the definitive Anglo Indian film, though the plight of the outsider is shared by Indians who shift base and try to make a home in an alien country. To the Irish are added Italian and Polish migrants who leave the Old Country to find a better life in America and who, inevitably come together with the Irish through romance and life’s fluctuations. Pure bred Indians are a rarity in this novel, though they are there and migrate to America and add to the Decalogue of narrators. Devika however is a feisty modern voice so she stands out and there is the alcoholic Billy Swint who deviates from the poetry with his own disconnected rap but seems almost a misfit, possibly because he is not given enough time. There is an underlying assumption of wisdom to the novel, underscored by a passionate poetic prose which sweeps the reader along in its wake. Yeats quotations begin each of the chapters, continuing what was started by the title. Each of the characters in this multi-generational novel has a deep sense of history – no one lives in the present – and the presence of the past allows Ray more scope for poetry. There is also a feeling that we are all connected under the skin which is why everyone’s story of migration and search for roots is ultimately the same kind of story. As the novel draws to a close, somehow this vast multi-generational sweep fails to draw the story together. One asks for a satisfying closure, perhaps a climactic wedding uniting Anglo Indians and Irish Americans in a happy surge of poetry, but that is not forthcoming. After all, the novel did begin with a murder and therefore that requires a solution. However, what happens is not the right closure for this ambitious portmanteau novel. No Comments on "No Country"